Eleven years. 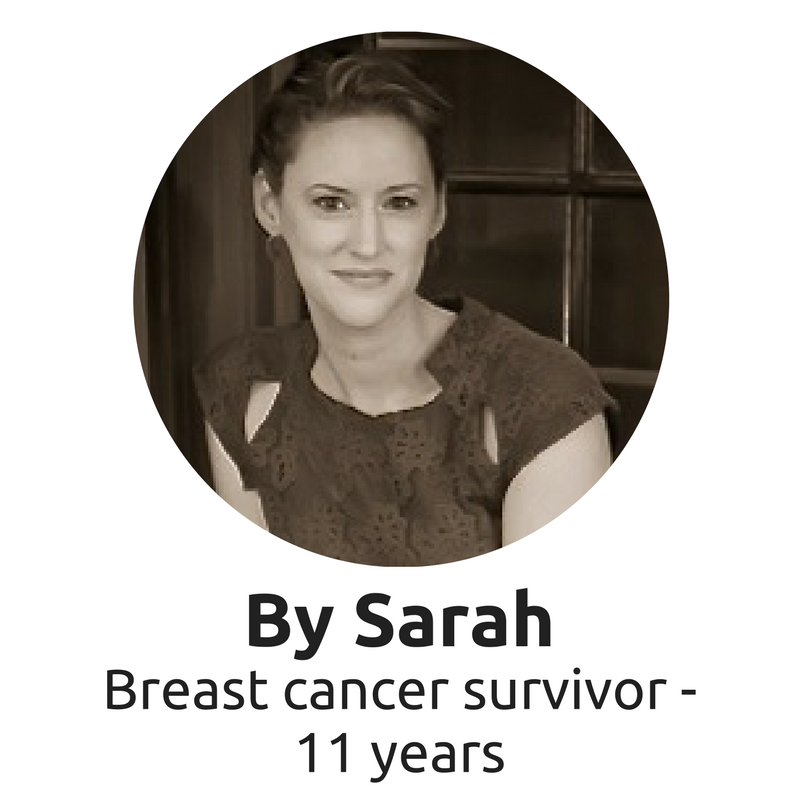 That’s how long it’s been since my oncologist said I was “technically cancer-free”. Often I deal with hardship by imagining myself in the future, to a time when that particular trial has passed. It helps me keep perspective in a bad moment. With cancer, however, I was unable to do that. I didn’t DARE do that. In 2006, even with those words from the doctor, I couldn’t even pretend to be able to imagine this point in my future. I was so far from emotionally and physically healed that I couldn’t see over the wreckage I needed to climb over to get to that imaginary other side yet. I was scared to stand on my tippy toes and squint to see it. Because... what if there was no THERE there? It was too awful to contemplate fooling myself. And I say all this as a naturally optimistic person. Even once all the chemo and radiation and multiple reconstruction surgeries were completed, I felt 30-going-on-50. I spent many months (years?) wondering if I would ever feel “young” again. Or “myself” again. It just didn’t seem possible. But somewhere along the way, it happened. It happened so excruciatingly slowly that I didn’t even notice it was happening. But it happened. 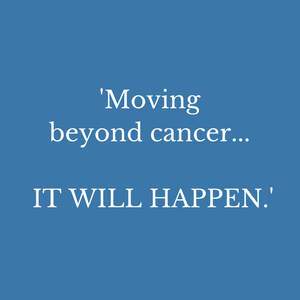 That’s the first thing I want you to know about moving beyond cancer. IT WILL HAPPEN. You will get yourself back again. Changed, yes, but still 100% you. Eleven years on I am happy to tell you that I can hardly even believe that was a chapter in my life. It seems. So. Long. Ago. Another “me” ago. Since cancer I have gotten married, moved countries twice and had a baby (which, mind you, we didn’t think I could do as a result of my treatment). That said, there is one other thing I will share about being so far beyond my cancer diagnosis. People will not “get” it. People who have not been through it will never understand the fear you carry in your heart that it could come back. Not even doctors. I tell you this because you will have the odd medical thing that brings your worst fears to the forefront. A stubborn backache might make your heart pound with fear. When this happens you will inevitably come across those who brush you off like you’re being hysterical. Or “dramatic”. Or people that think the appropriate response is to tell you horror stories of neighbors and cousins and friends-of-friends who had mysterious pains like yours. Ignore them. Ignore all of them. No one fathoms the well of fear you learn, over the years, to board up (so you don’t fall down inside it) and cover with leaves somewhere in your emotional backyard. With each passing year that well becomes more and more overgrown and harder to find, but you will stumble across it from time to time. People will not understand, but you do not need to apologize. It’s normal, even if they don’t know it. Lastly, you do with your “well” what you have to. After my treatment I saw many “cancer friends” embracing the fundraising and race-running and awareness-raising events with gusto. They hugged the friends they made at these events and championed (as they should) the monies they had raised. All I felt when I became too involved, however, was despair. 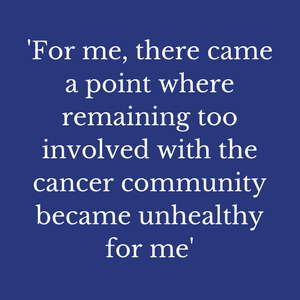 For me, there came a point where remaining too involved with the cancer community became unhealthy for me. There were too many bad stories, stories that devastated me and stories that frightened me. Yes, there are wonderful stories, too, but personally, I couldn’t be too close. It kept me gazing down my well and unable to tear myself away and move on. For me, getting over cancer is like grieving. It never fully goes away, but it does get better. It’s something that you have to learn the best way to live with, for yourself. But know that you will find that way, and don’t let anyone else’s ideas or expectations derail you along that journey. See you other other side of the wreckage! Let us know so we can keep it up. It does now seem almost like it happened to someone else, but that's testament to how amazing you were throughout (and after) the whole ordeal. I am now 20 years on and this so resonates with me. I too am me again but the fear never goes and when I have friends who are diagnosed, I always try to support but it has a dire effect on me. I dream chemo and bad news over and over again. Well done on writing this - it needs to be said. Yes, totally agree every pain every ache brings me back to my diagnosis 6 years ago! But despite that have tried to support friends and family going through the same thing! But memories are hard to forget thank go for my supportive family! Thank you, Sarah, for this. There are so many truths here! I really like the support that is out there, but so true, that sometimes it is so painful, what others continue to go though. At almost two years past treatment, having insight from someone at your stage is nice to see. Thanks for writing this. It was amazing to read this. It almost mirrors how I have been since my diagnosis 6 years ago. I too have found it so very hard to move past. It catches me unawares at times and the memory of it all is overwhelming for a moment or two and I am back in that period that I so want to push away forever. Yes it gets better, but it’s always there. However, I used to wake up and it was my first thought...I have got cancer...I’m glad to say that is over. I hope we all get to the point where it’s possible to relax a little and not think each and every ailment is because th cancer is back. Thanks for writing this, it has helped to know it’s not just me. You are so right how no one can possibly understand unless they have been through it. I agree how getting away from the cancer environment when you are feeling a lot better does help you to move on and be normal again. You certainly need it though when you are going through it it’s like a security blanket to you and at first hard to leave behind. As all those nurses are amazing. I find keeping busy, out for lovely walks in the fresh air is like a tonic for me and going back to work all makes me feel normal again and helps you to leave it all behind you and move on. Appreciate all the good things in life that are more important than anything like family and good friends. Most of all have time for them too.